The field that deals with the applications and tools that are based on pressurised gases or air are called pneumatics. 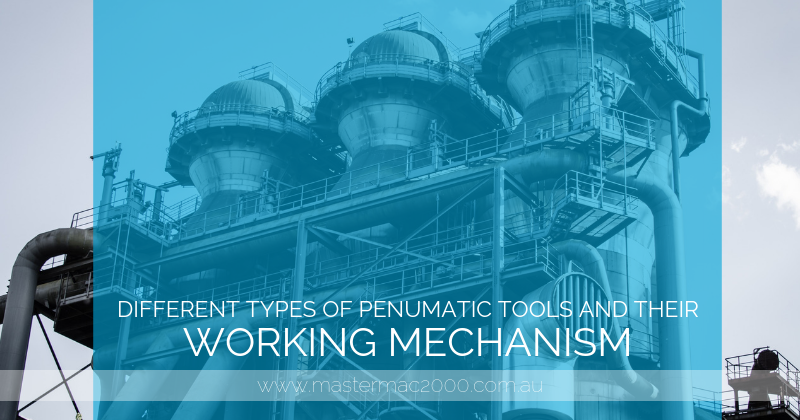 These pneumatic tools, machines, and systems vary from their hydraulic and electric counterparts with regard to their respective driving forces. While hydraulic tools work on pressurised liquids and electrical tools using electricity, pneumatic tools deal with compressed air or gas. Popular examples of pneumatic tools include air rams, cylinders, grinder, nail gun, and screw guns that are widely utilised in domestic and industrial applications. The reason why they are commonly used is due to their ease of use and safety features. Given that stored air or gases have potential energy that can be converted into kinetic energy once they are compressed, they can expand, forcing the piston to move. The great force of the pressurised gases is what forms the basis of pneumatic tools. Let’s discuss the different types of tools that are based on air pressure and their working mechanism. One of the tools that are popular for nailing and using screws at high speeds is air guns. They are used in building construction, carpentry, and woodworking. Pneumatic screw guns are for fast feeding screws. Know that the earliest forms of nail guns were solely based on the utilisation of air pressure. There are different types of pneumatic cylinders. Double acting cylinder, rodless air cylinder, rotary air cylinder, and single-acting cylinder just to name a few. Such pneumatic tools are preferred by many for many reasons. One is that they are environment-friendly. Second is that they eliminate noise and the need to store liquids during operation. Pneumatic sprayers are tools used in coating large surfaces with paint within a short period of time. Their working mechanism is similar to pneumatic guns. These tools come with parts like pneumatic cylinders, pistons, and valves that are used in applications such as in chemical and oil refining industries. Other tools like pneumatic air rams, drills, grinders, sanders, and wrenches are also popular in specific applications. Today, there are improved versions of pneumatic tools to facilitate specific needs of domestic and industrial users. They are being traded across the globe through online business e-commerce sites and business directories. If you want to learn more about pneumatic tools and their corresponding uses in detail, contact Mastermac2000.com.au today!